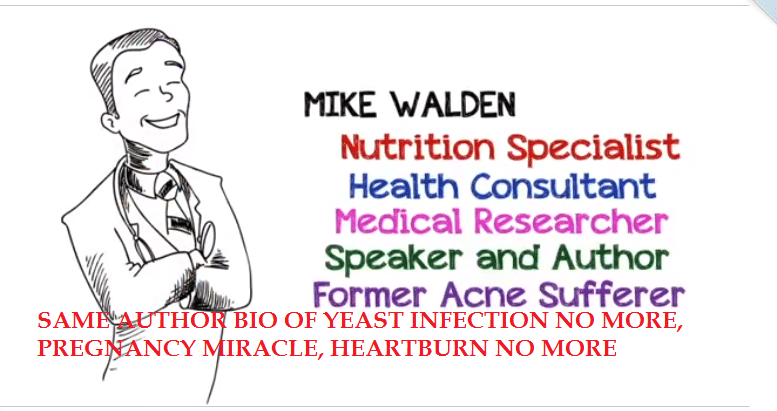 Don’t waste your time trying Acne No More by ‘Mark Walden’ because it is a lousy, dangerous scam! This product is not just a worthless piece of garbage, but it is a part of a ‘[Insert any disease here] No More’ scam empire currently infecting the Clickbank marketplace. This review will be short because there is actually no point reviewing Acne No More in the first place. This is because there is no much difference between Acne No More and known scams Yeast Infection No More, Heartburn No More and Pregnancy Miracle. However, I’m going to highlight a few things about the scam just for documentation sake and for the sake of those new to Contra Health Scam. It claims to be suitable for ‘all types of acne’ located in any part of the body, no matter how severe. But as you’ll soon discover in this review, all these claims are completely bogus! So lets dig right in immediately (I’ve not forgotten my promise to make this review short). 1. Mark Walden Does NOT Exist! This one is easy. Take a look at the screenshot below. In addition, there is no real photo of the said Mark Walden (a cartoon photo doesn’t cut it). Good luck finding him on social media or in any respected health journal. If you take a look at Acne No More’s website and those of Yeast Infection No More, Heartburn No More and Pregnancy Miracle, you’ll quickly notice that they are the same. Same website design, same video style, same author bio. In fact, the scammer even used the same script in all the scam websites but only modified it to fit the disease being discussed. Proving this is extremely simple. An important – and my favorite – highlight of the video presentation is the claim that the video ‘will not be online for long.’ As you know already, Acne No More was created in 2005. This is 2016. Now do the math. Expected result: 11 YEARS. Conclusion: 11 years on, Acne No More, whose video won’t be online for long, is still online. What does that tell you? Mind you, this same claim was made in Yeast Infection No More, Heartburn No More and Pregnancy Miracle. Acne No More is a comprehensive non-medicinal acne system, with numerous tips and strategies designed to treat acne. Yet many users report problems with the Acne No More system – mainly, the incredible amount of fasting, dietary changes, and weight loss that is a part of that system. There is very little research evidence that diet affects acne in any way, with the possible exception of high glycemic carbohydrates and dairy products. There are some vitamins and minerals that appear to relieve acne, but few changes to your diet that can prevent acne from being formed. So it seems unusual to have serious dietary changes as a part of any acne cleansing system. In addition, fasting and serious changes can be unhealthy. Some users report losing more than 20 pounds of weight on the acne system, and that amount of severe weight loss rarely comes without a health cost – especially when it is not due to exercise and balanced eating. Final Recommendation: DON’T BUY Acne No More. It is A Scam! Disregard all the numerous, fake testimonials and save your $37. Just know that acne in your teenage years is a perfectly normal process, but if it recurs severely after age 25, it may indicate sexual hormones imbalance [WebMD]. In that case, see your doctor, who will evaluate you and prescribe appropriate treatment. I was looking for honest unbiased reviews for a health product I recently stumbled across and your reviews say it is fake and not worth the try. I believed in you until I saw this… I have tried acne no more and although I do not follow the instructions and never complete the whole regimen it tells me to do MY ACNE IS COMPLETELY 1000% BETTER THAN IT USED TO SO FOR EVERYONE WHO IS LOOKING FOR AN HONEST REVIEW FOR ANY HEALTH TELATED PROGRAM YOU FOUND ON NET LET ME TELL YOU THIS THE FACT THAT THIS WEB CLAIMS SOMETHING FAKE WHEN IT ACTUALLY WORKS TELLS YOU THAT THIS WEBSITE TOO IS A SCAM.